And its official!! 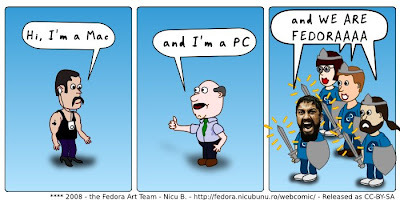 !, Fedora 11 name has been decided!!!!!!!!. Got hit with a rare inspiration moment, fired up inkscape, and took Nicu's Webcomic SVGs - and created my first webcomic!!!!!!!! Credits to Nicu for the WebComic SVGs. You should change the copyright line at the bottom and use your own name as you are the author. Can you please give me the svg for this? I am Fedora Ambassador from Brazil and I want translate this for portugueses. I will follow your licence.